Looking back at my previous posts, they were looking a little too vegetarian/vegan. It’s time to put some meat on ‘dem bones blog! I realize salmon isn’t meat (fret not…there will be more meat-centered posts to come), however it is an excellent source of protein along with providing omega-3 fatty acids, which help to improve heart health. Omega-3 fatty acids can help lower triglycerides, regulate heart rate, slow the formation of plaque in our arteries and may help decrease blood pressure. On top of all that, they also work to inhibit inflammatory processes in our body (AKA they are anti-inflammatory). Salmon (wild-caught Alaskan): Canned varieties can easily be made into a salmon cake, salmon salad or drizzled with olive oil and eaten with crackers, as-is. Sardines (wild-caught, Pacific): all I am saying, is give sardines a chance. Really! There’s a tendency to give me the stink face when I mention sardines but I promise, they’re delicious! Try ones that are smoked and served in tomato or my favorite – cayenne pepper sauce. Serve over arugula or spinach for a quick dinner salad. Rainbow Trout (farmed, U.S.): I find an amazing, local variety from Wisconsin at Whole Foods. It comes as a filet that I usually stuff with veggies and sometimes cheese and bake in the oven. Tuna (light, skipjack, troll- or pole-caught): canned chunk light tuna (skipjack variety) is lower in mercury than chunk white tuna and also makes for a super-quick protein addition to lunch or dinner. I like it mixed with salsa and a little olive oil topped with diced avocado on a corn tortilla (add cilantro and lime for a little freshness). For a list of the most sustainable seafood options, check out Monterey Bay Aquarium’s Seafood Watch Pocket Guides. I LOVE their app and it makes me feel way less dorky to look something up on my iPhone rather than having to pull out a little paper brochure. Though my go-to salmon preparation is salmon with Island Teriyaki sauce from Trader Joe’s, served with brown rice or quinoa and steamed broccoli (for sure would be my last meal), I wanted to venture out. Seeing that I like to cook with Mediterranean flavors, I created this recipe for Mediterranean Salmon with Green Olives and Carmelized Red Onions. Enjoy! 16 oz wild Alaskan salmon, cut into 4, 4-ounce pieces. Preheat oven to 375. Spread 1/2 Tbsp tomato paste over each piece of salmon and spray with cooking spray. 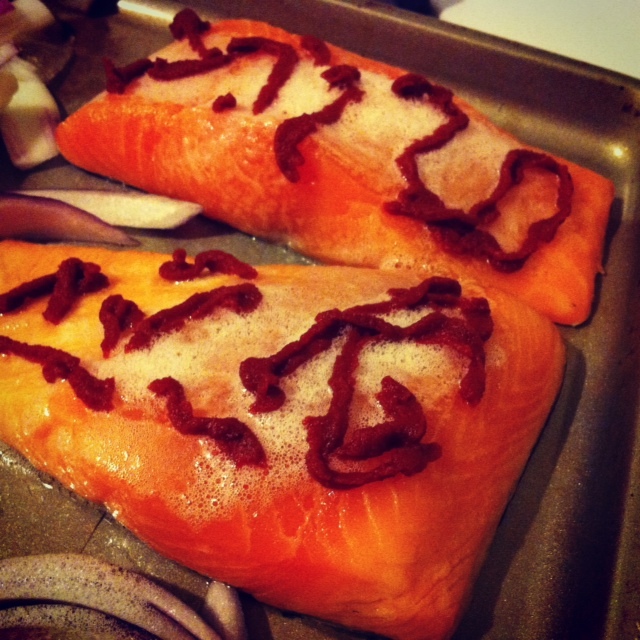 Bake salmon for 12-15 minutes, or until opaque and flaky. Used the tomato paste tube from TJ’s – hence the squiggles of tomato paste. While salmon is baking, heat 2 Tbsp olive oil in large sauté pan and add diced red onion. Sauté 5-7 minutes, or until onions are carmelized. If desired, add 1 tsp sugar to the onions to bring out their sweetness. Mix red onions with chopped green olives. 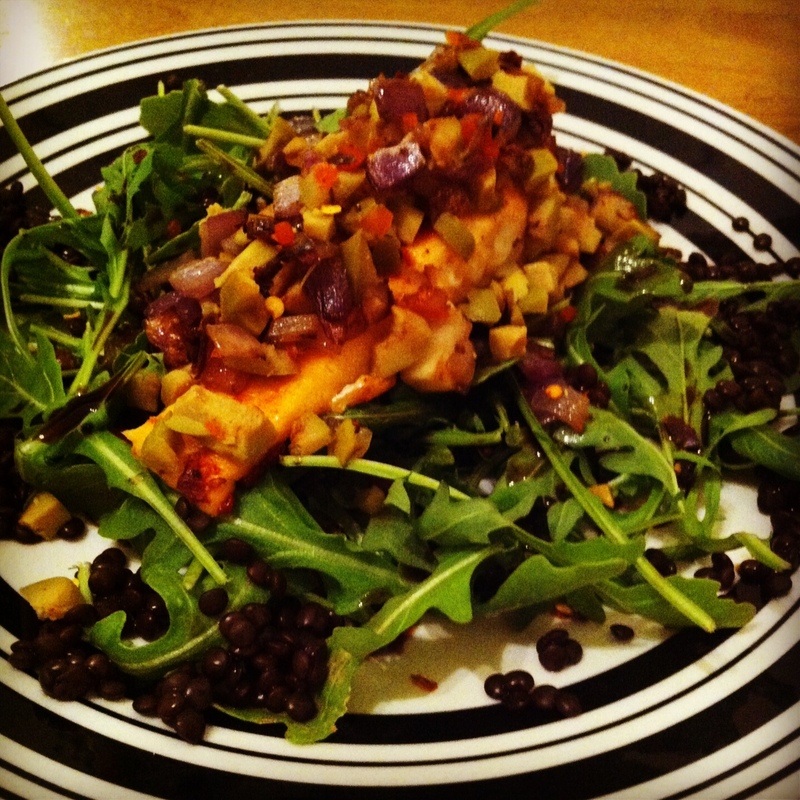 Place 1 1/2 cups arugula on plate (I also had leftover black lentils, which I sprinkled on top of the arugula) and top with salmon filet. Spoon 1/4 of the onion/olive mixture over salmon, and drizzle with vinegar and oil. Wild salmon is one of my all-time favourites!